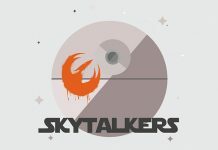 Please join Tarkin’s Top Shelf in welcoming, a very talented wordsmith, a gifted published writer, a New York Times Best-Selling author, and a Star Wars fanatic from behind the pages, the lovely E.K. Johnston! In this episode of Tarkin’s Top Shelf, Mark and Becca get behind the guise of Star Wars: Queen’s Shadow as they sit down with E.K. Johnston and discuss everything and anything about Padme’ Amidala, and her literary process of getting to know our beloved Queen, inside and out!